Google just updated its mapping service on iOS to support the Apple Watch. Now, users can get driving, walking, or transit directions all on their smartwatch – but hold the party poppers and put down the champagne – as it's not quite the release we expected. The update provides users with text-based step-by-step directions that can be sent to Apple Watch after the user has started the navigation feature on an iPhone. The features are extremely limited and there isn't even a map on Google Maps. You must search for and start navigation from the iPhone app before it will show up on the watch app. However, you can quickly access up to three recent routes from the Watch without having to open your iPhone app again, which is pretty nifty. The Apple Watch app will also reflect the type of transportation your iPhone app is currently set to. So, if you first got driving directions to the Mascone Center in San Francisco, CA, and then got walking directions to the nearest coffee shop, the next time you call up directions to a previous route, it will take you the same way. There's no getting away from the fact that Google Maps is lacking when compared with Apple Maps right now. It doesn't even support Glances, and with the power in Google's platform, there's so much unrealised potential here. 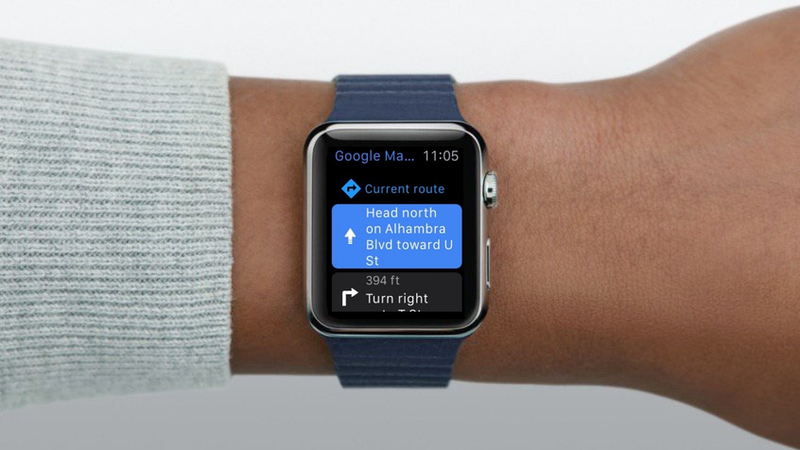 For mapping support on Apple Watch, we suggest you stick with Apple Maps until Google adds more useful features.